American Airlines Vs. Qantas: Which Airline To Fly To Australia? Last week, American Airlines announced a transpacific partnership with Qantas that will include a new daily nonstop flight aboard AA’s flagship 777-300ER from Los Angeles LAX to Sydney starting in December 2015. TPG Special Contributor (and frequent Qantas passenger) Eric Rosen takes a look at both airlines and the factors that should help you decide which to choose on your next trip down under. 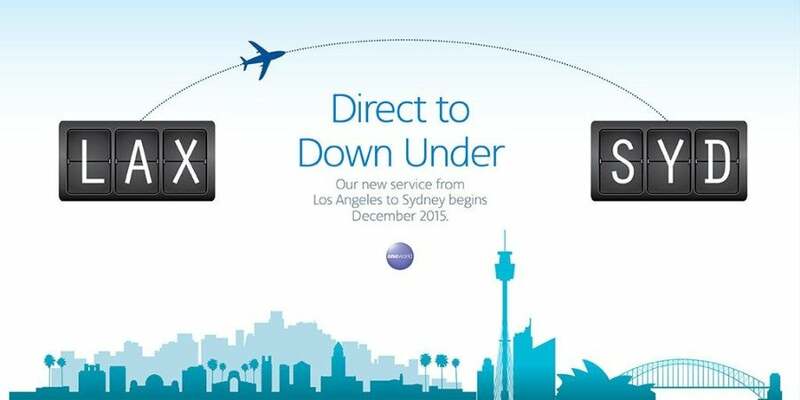 The news that American Airlines would be launching an LAX-Sydney flight and Qantas would add service to San Francisco were both exciting tidings for frequent flyers, especially those of us based on the West Coast — it means more options for getting down to Oz. However, it also means more choices for redeeming your miles (since both airlines are in Oneworld, you can use American, British Airways and Qantas miles among others on either). That means it’s more important than ever to know what you can expect onboard. Here’s a quick rundown and comparison of both airlines’ classes of service, food and other amenities, upgrade options and more. American: The economy seats in American’s cabins are 17 inches wide and have 31 inches in pitch – pretty standard, though a bit on the narrow side. There are 220 of them in a 3 x 4 x 3 configuration, with the exception of a few exit rows, where there are just two seats on each side of the cabin. If you can, try to score seats in rows 20 or 31 for extra legroom. Each seat has its own VOD entertainment screen. Economy seats on America’s 777. Qantas: Qantas’ economy cabin takes up most of the lower deck (the first-class cabin is at the very front) of the A380 and includes 371 seats in a 3 x 4 x 3 configuration. Each has just 31 inches in pitch and is 17.5 inches wide and has its own VOD entertainment system. There are 275 of these seats on the refitted 747. Winner: Tie. The seats are pretty much the same size, though you might prefer American’s smaller planes. American: Not necessarily premium economy, per se, American’s 777-300ER features its slightly more spacious Main Cabin Extra seats, though you won’t get any extra amenities or better food than in regular old economy. Instead of a 3 x 4 x 3 configuration, these 30 seats are in a 3 x 3 x 3 arrangement at the very front of the economy cabin. Each has 36 inches in pitch standard, and is 18 inches wide. Main Cabin Extra passengers get priority boarding, which is a nice little perk — though you might not want to be on the plane any longer than necessary since the flight is so long! Qantas’ premium economy is roomier and has better amenities. 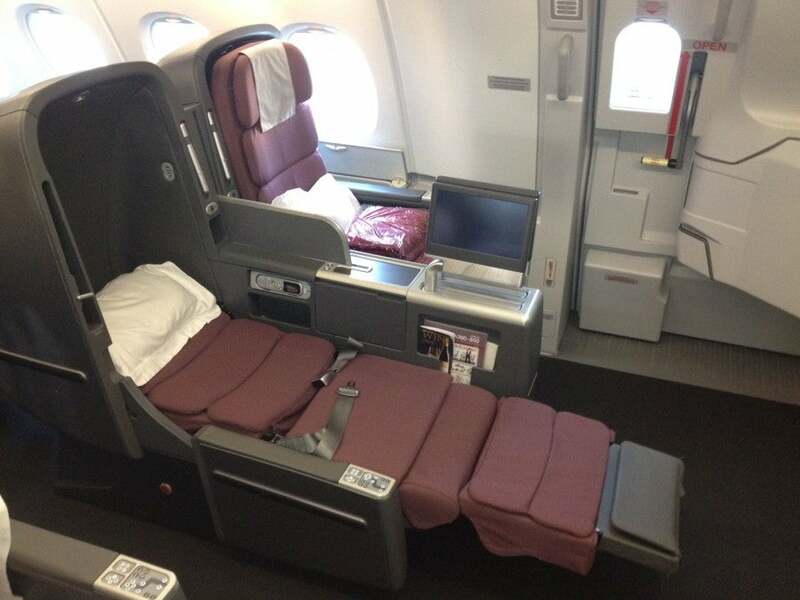 Qantas: Depending on your aircraft, there are 32-40 premium economy seats on Qantas’ international long-haul fleet. The supposedly ergonomic seats were designed by Marc Newson and built by Recaro. On the A380, there are 35 of these seats in the very back of the plane’s upper deck in a 2 x 3 x 2 configuration. Each has between 38-42 inches of pitch and is 19.5 inches wide. On the 747, there are 40 of these seats with 38 inches of pitch and 19 inches of width … so not as good. They feature footrests and some extra room with wider center and side consoles as well as 10.6-inch personal touchscreen IFE systems. 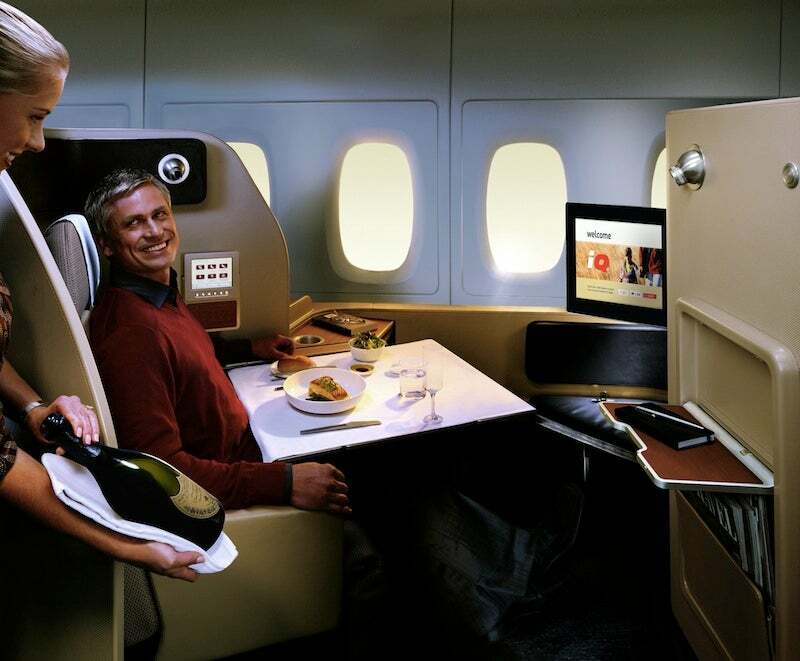 Passengers who book these seats also get to choose from a special premium economy menu from Neil Perry’s Rockpool restaurant group, and have access to self-serve refreshment bars on the A380 and refurbished 747s. Passengers get a mini amenity kit with eyes shades, toothbrush and toothpaste as well as socks on request and larger-than-economy cotton pillows and blankets. Passengers also get priority check-in and boarding. 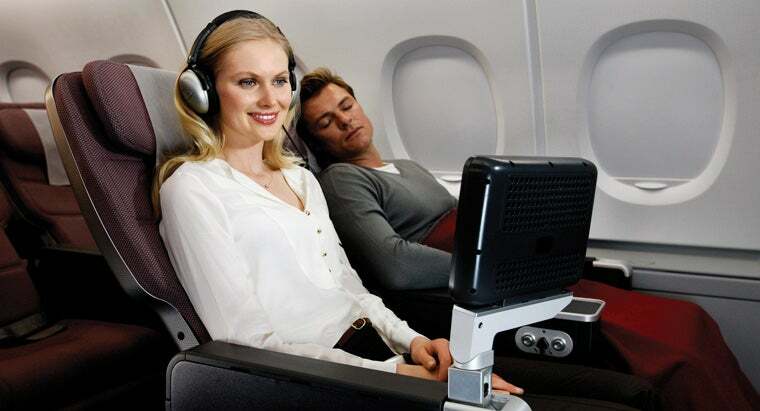 Winner: Qantas, since American doesn’t really offer a distinctive premium economy product. That said, getting a Main Cabin Extra seat is usually a matter of around $200 each way even on international long-haul routes, while the price difference between economy and premium economy tickets on Qantas can be nearly $1,000 in some cases. 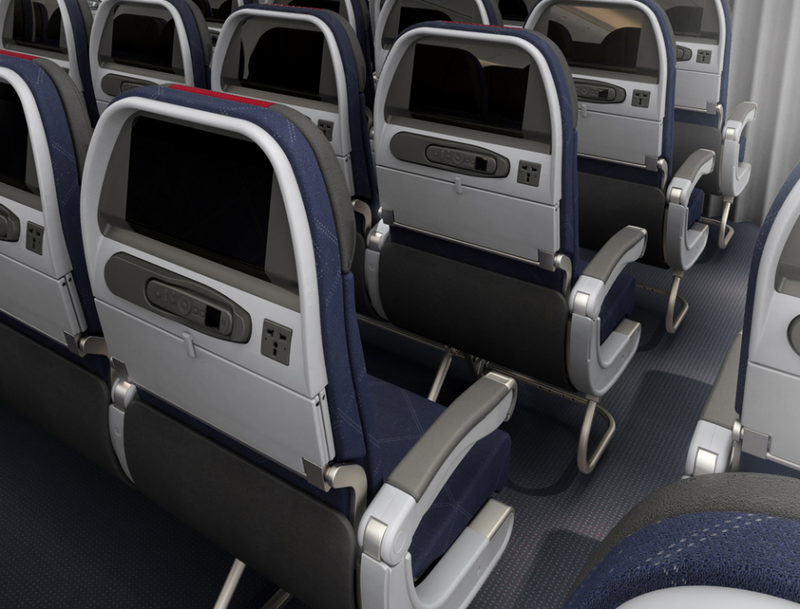 American’s 777-300ER business-class seats are new and in the popular reverse-herringbone configuration. American: This aircraft features American’s newest business class, and one of the most popular seat styles in the skies these days: a reverse herringbone layout, which offers aisle access for all seats and a fair amount of privacy for folks on the side of the cabin. In a 1 x 2 x1 configuration, each of these seats is a roomy 26 inches wide and has 43 inches of pitch while in the chair position, but reclines to a fully flat 78 inches. Their IFE monitors are 15.4 inches. There are 52 total in the cabin. Qantas’ lie-flat business-class seats are looking a little dated. Qantas: Qantas’ A380 features an almost all-business-class upper deck (premium economy is at the very back) in a 2 x 2 x 2 configuration, and not every seat has aisle access. The 64 seats are forward-facing pods designed by Marc Newson, with 78 inches in pitch and 21.5 inches wide. They recline to fully horizontal flat beds. Qantas’ refitted 747s have the same business-class seats, only in a 2 x 3 x 2 configuration in the main cabin, and 2 x 2 in the very front of the plane and on the top deck (the two side seats in row 5 don’t have anyone next to them, though). There are 56 business-class seats on this plane. The IFE monitors are a mere 12.1 inches. Winner: American. Its business class is newer and a better hard product than Qantas’, even though some of the softer amenities (see below) might be lacking. American Airlines 777-300ER first class. American: When American unveiled its new 777-300ER, most folks were disappointed by the first-class cabin, which is barely an update on the old flagship first seats. Still, they’re fairly comfortable, throne-like installations in a 1 x 2 x 1 configuration. Each is 30 inches wide and has 64 inches of pitch while seated and 78 when reclined to a lie-flat bed. The IFE monitor is 17 inches. 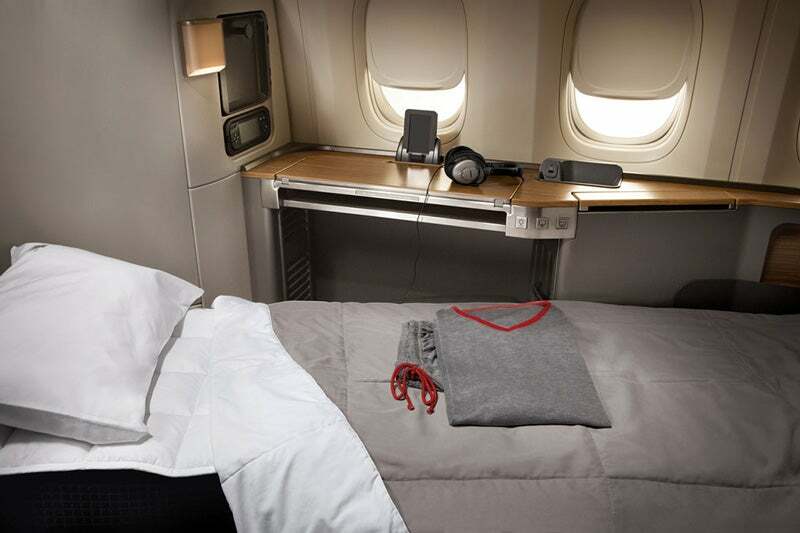 Qantas: Qantas’ first class was rather swank when it debuted a few years ago, but the Middle East carriers as well as suite-style products on many of the Asian airlines (notably Singapore) have made it look a little obsolete. Still, they’re pretty nice, and, with just 14 aboard the A380, fairly exclusive. Qantas’ first class is nice … but a little outdated. Each is a semi-private pod and has 79 inches of pitch with 22 inches of width, with a large VOD touchscreen for entertainment and enough room to see another person fairly comfortably for dining. Winner: Qantas, thanks to seats that are a bit more private and distinctive than American’s lackluster product. American’s food choices aren’t terribly appetizing. American: I don’t think it’s any surprise that the food American serves is … less than compelling. In Main Cabin (economy), here’s how American puts it: “We serve complimentary meals in the Main Cabin on flights to and from Europe, Asia, select flights to Latin America that depart within traditional breakfast, lunch and dinner meal windows.” Presumably that will also be the case on flights to Oceania. There should also be some complimentary beer and wine choices. Passengers in business and first class can pre-order meals on certain flights to Europe, Asia and South America, so the Sydney flight will probably offer this choice, as well. American’s wines are chosen by consultant Ken Chase, though good luck knowing what’s going to be on your plane, since the airline usually fields about 60 labels and 15 different lists depending on where you’re flying. Qantas’ menus come courtesy of Aussie celebrity chef Neil Perry. Qantas: On the other hand, Qantas partnered with Aussie celebrity chef Neil Perry of the Rockpool restaurant group back in 1997 — pioneering the airline/chef partnership — and he now designs all the menus for first, business and premium economy classes. Business and first-class passengers can pre-order their meal within their reservation between seven days and 12 hours in advance of flying. First-class passengers have a choice of 12 main courses, or the option of an eight-course tasting menu, while business-class meals include three courses: a starter, main and dessert. Qantas also takes its wine program seriously and views itself as a sort of flying advertisement for the Australian wine industry and even produces a detailed wine guide for passengers. American’s got some cute retro amenity kits in business class now. American: American recently introduced limited-edition “heritage” amenity kits, each with the livery colors and logos of one of the nine airlines that have merged with American over its history, including TWA, Piedmont, Allegheny, America West and RenoAir, among others. The skincare products are by Akhassa in first class and Red Flower in business class. First-class passengers get (in my opinion, hideous) pajamas as well. 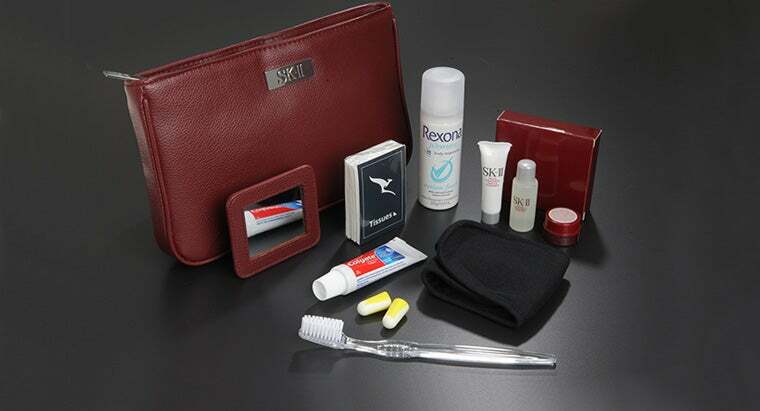 Qantas’ first-class amenity kits include SK-II products. Qantas: The Aussie carrier’s amenity kits in first class include SK-II products, while those in business class are stocked with ASPAR by Aurora Spa. Both business and first-class passengers are treated to “sleeping suits” emblazoned with the airline’s kangaroo. 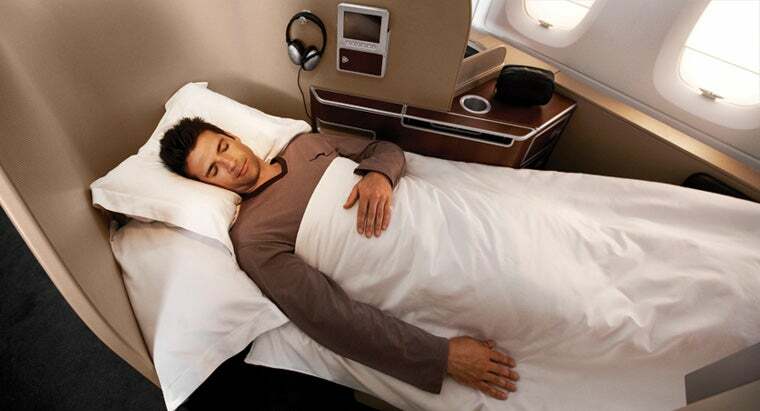 Winner: Qantas gets the slight edge here by treating premium-cabin passengers to pajamas. There’s nothing like stepping onto a plane and feeling like you’re already at your destination … or getting one final experience of your trip, and this is where Qantas pulls ahead of American in the service category. While American’s 777-300ER crews tend to be flight attendants with the most seniority, those aboard Qantas’ A380s are younger and seem more dynamic, not to mention more energetic and welcoming. I’ve actually had some great long-haul experiences on American with crews that could not have been nicer or more professional, so perhaps it’s just a matter of personal opinion, but it’s still just more fun to fly Qantas. However, one major factor in American’s favor is that its 777-300ERs are equipped with Wi-Fi, so if you need to stay in touch while in the air, that could be a big plus for you. This is bound to be a big one for all the flyers out there looking to redeem miles: Which airline is going to be better for booking awards? The sad truth is, despite the addition of a daily flight from LAX-SYD on American adding several hundred more seats to those Qantas has on its two daily flights on the same route, it’s probably not going to get much easier to book awards on either airline. In overall terms, much probably won’t change since most of us were likely to use American miles to book an award to Australia on Qantas anyway — but at least now there’s a choice of Oneworld carrier for us. American hasn’t added its flights into the reservations system yet – probably because they’re pending government approval and won’t start flying until December anyway – so that’s making it rather difficult to gauge availability. Economy availability is actually pretty decent, especially if you’re flexible on dates. However, based on my experience booking Qantas awards, economy availability actually tends to be pretty decent; usually there’s more availability flying from LA to Brisbane or Melbourne and then on to Sydney from there. Business-class awards are still few and far between, and you might have to go through Brisbane or Melbourne. Business-class awards open up once in a blue moon, and by that, I mean just a handful of dates each year as far as I’ve seen over the past several years. The same is true of first class. 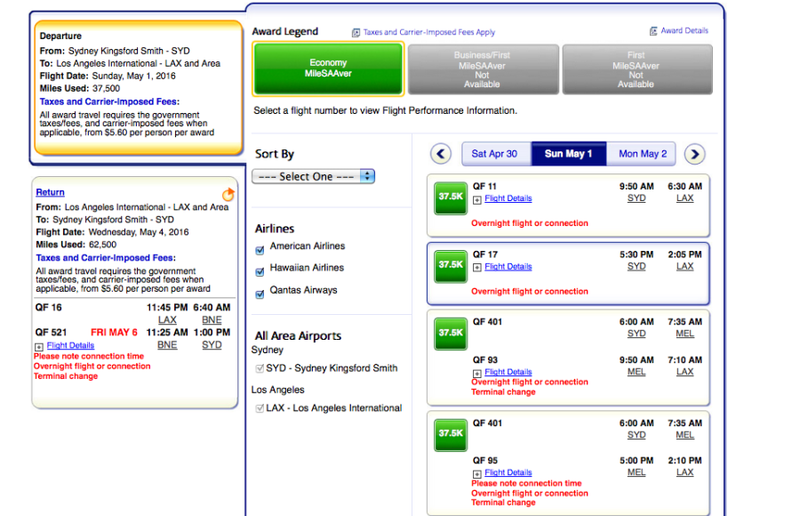 That said, it’s not impossible to find award seats; you just need to keep looking and be very flexible with your dates, as well as setting ExpertFlyer alerts so when seats open up, you can be the first to book them. You’ll notice that Australia is not yet included, but I think it should probably ring up at 25,000 miles + $350 each way from discount economy to business, 15,000 miles from full-fare economy to business, 25,000 miles + $550 from discount business to first, and 25,000 miles from business to first. Just keep in mind that you can book flat-out awards for 62,500 miles each way in business and 72,500 each way in first. Check out this post on improving your chances for an upgrade on American. That might not seem like a great option, but remember that Qantas is now a 1:1 transfer partner of Citi ThankYou Rewards — so if you have the Citi Premier Card or Citi Prestige, it’s still one to consider. Winner: American, thanks to the ease of using systemwides and having a mileage upgrade option as well. Qantas arguably has a friendlier brand and absolutely better food and wine, but American’s hard product in business class is the better option. Hopefully we’ll see a bit better award availability as more seats are put into service on this route (though I’m skeptical). At the very least, American’s entry into the market is another great option to have.